My phone binged, and I saw Luke's name appear on my screen. I immediately dropped my phone, my heart beating so fast. There could only be one reason why Luke was messaging me personally. I opened the conversation and started to read, squealing with glee because what I had hoped he was about to say was true. "I would love to propose to Caitlin while you're here, and I was wondering if you would be willing to photograph it?" Cue all the happy dances and celebratory champagne pops. You see, I wasn't dancing because my portfolio and these two go together like peanut butter and jelly (even if that is 100% true). I was dancing because two dear friends were about to say yes to forever with each other, and I was getting a ticket to the front row seat. I met Caitlin and Luke last year when I photographed them at the sand dunes in Colorado (which you can check out right here! ), and had become fast friends with them. My husband and I hit it off with these two, so when the opportunity arose to come visit them in Denver while my husband was away, I jumped on it. Luke's message hit my inbox about 2 weeks before I was to arrive, so we immediately got to work scheming. 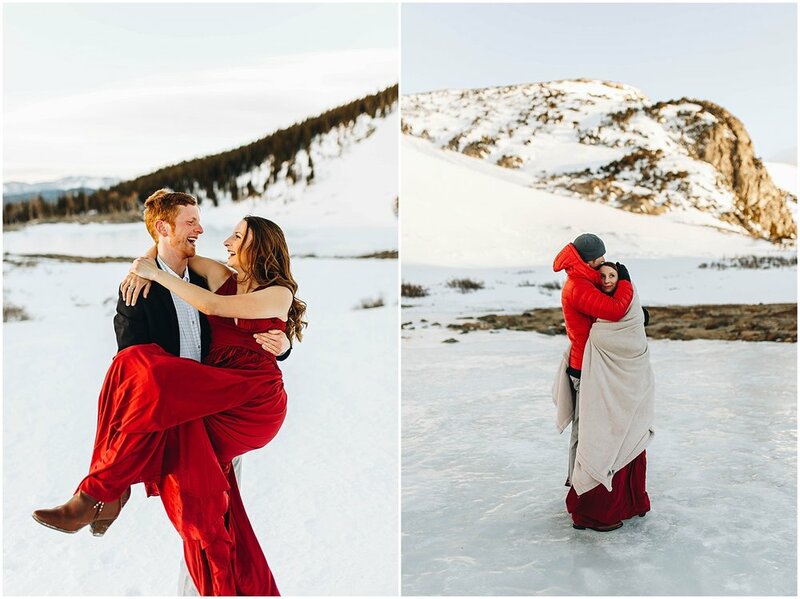 Luke really wanted to propose in the snow, so I presented an idea to Caitlin about them both being my models for a snowy session in the mountains. Luke and I had reasoned that the more this shoot looked like it was about my creative whims and less about them as a couple, the less likely she would suspect anything. And boy were we right. I stayed at their house for 3 days before the proposal and every time Luke wasn't around Caitlin would tell me how much she wished he would propose, how she wished he would have thought to do it while I was here, etc... And every time the topic came up, I put on my best acting face and gave her the performance of a lifetime. ;) (Hey, I didn't major in acting for nothing..) The night before the shoot, I stood in their closet with Caitlin picking out what I thought would look good in the snow, and even when we chose to go super fancy she still didn't suspect a thing. We woke up on March 4th at 4am, and drove to St. Mary's Glacier in the dark. I checked my phone's messages again in the backseat and saw Luke's confirmation. "The ring is in my pocket. We're good to go." We parked and began the short hike up the glacier before the sun had even risen. Once up at the top, they changed into their fancy clothes, a feat in and of itself due to the bitter cold. We started the shoot, eventually making our way to the frozen lake. We were in the perfect setting with the perfect light. It was my cue, the one Luke and I had rehearsed and talked about. After a few poses on the ice, I gave my best perplexed face. "Ok I want to do a few more shots on the ice, but I can't think of any more poses. Do you guys have any ideas?" Luke put his hands on his hips, and gave Caitlin a smirk with a twinkle in his eye. "I have an idea." Then he pulled the shiny ring from his pocket, got down on one knee, and asked if Caitlin would "March Fourth" in life with him. She said yes. And we all happy danced.